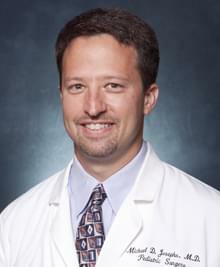 Dr. Josephs moved to Austin from the East Coast in 2002 to provide surgical care to the children of Central Texas. In addition to the state-of-the-art healthcare environment, he was drawn to the vast opportunities for outdoor activities in the hill country along with the many live music venues. I was introduced to surgery at the age of 5, watching my father operate on feet in his podiatry office. I was instantly compelled to continue in the spirit of helping people with surgery, although my interests extended beyond the ground level. By the age of 10 I had memorized the human anatomy, and my decision to be a surgeon never changed. During residency training I was in awe when I understood the impact that operating on a child provided to families. I can imagine no greater responsibility than taking care of someone's child, and I am honored and humbled to make an impact on so many lives. My primary focus is to provide comprehensive care to children who require surgery, understanding that the families are my patients as well. Whenever possible, my operations are performed minimally invasively in order to reduce pain and complications. Additionally I have been working to develop new instruments and devices which will advance the care of children who undergo surgery. I also enjoy teaching new doctors in training and contributing to the future of our healthcare.